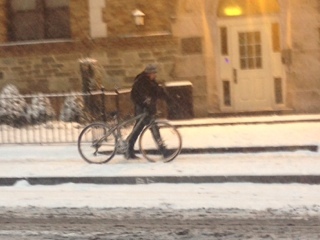 Transportation (DDOT) bicycle program manager, issued an email this morning regarding the impact of this weekend's blizzard and the clearing of snow from the District's bicycle infrastructure. Clearing bicycle facilities in the blizzard proved to be a challenge due to the conditions and the amount of snow. On Saturday there was too much snow for the special equipment to move the snow in the narrower bike lanes. Crews did manage to clear much of the Metropolitan Branch Trail and the Pennsylvania Avenue cycle track. We will try again Monday and Tuesday when we have more staff and equipment available and warmer temperatures. It could be a few days before all the protected lanes are clear. Regular lanes are normally cleared by regular plow on their regular shifts. However, because of the large amount of snow, plows can not get as close to the curb or the parked cars as needed to clear the lanes. Thus it will likely be several days before the regular bike lanes are clear. In the mean time, bikes share the road with motor vehicles so we ask both to use caution. DDOT and DPW crews are also working on clearing bridge sidewalks. Once again, due to the large amount of snow, most of these are still full of snow due that was cleared from the adjacent roadway. It may may a few days before all of these sidewalks are clear. For reglar (sp) sidewalks, we continue to ask residents and business to clear their sidewalks as soon as possible for critical safety and access. We also ask motorists to drive slowly and watch for pedestrians in the roadway. For Rock Creek Trail, Capital Crescent Trail, and Mt Vernon Trail, contact the National Park Service. Capital Bikeshare is closed today (Monday) while crews clear out stations. There has been no decision yet on when we will be able to reopen. Be safe and please give us the space we need to work.